We all want to throw an unforgettable party for our kids, but we don’t have to break the bank to do so. Fortunately, you can throw a big party on a small budget with the right plan. You won't have to sacrifice much, either. 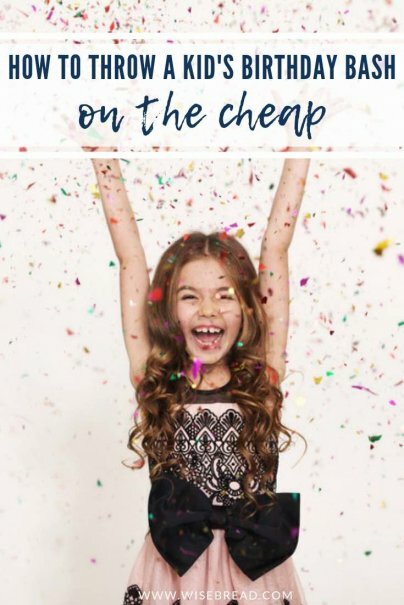 Here's how to save money on your child's special day. Get your child involved in planning the party so they take part in the fun leading up to the special day. Invite one or two of their friends over before the party to help decorate. They can make their own decorations, blow up balloons, and cut out signs. Instead of expensive printed or themed tablecloths, cover tables with butcher paper and leave out crayons so the kids can write messages and draw while they eat. Don’t just visit your local party supply store. If you have time (and energy), you can find some great deals at dollar stores and online suppliers like Oriental Trading and Alibaba. Shipping can take a few weeks, but you will likely find everything you need, from plates and cups to streamers and balloons, and even fun toys like bubbles, glow sticks, and water balloons for the party. According to Danielle Walker, author of Against All Grain: Celebrations, the best time to throw a party is between 2 p.m. – 5 p.m., when guests are between meals and won't be expecting a full meal. You can just provide kid-friendly finger foods for them to munch on. If your child's birthday falls close to one of their classmates' birthdays, you may consider joining forces with the other child's parents to throw a larger dual party. It's great to have a party theme and budget in mind. This can keep you on track and provide inspiration during the party planning stages. However, it can be pricey if you try purchasing only themed items. For instance, purchasing Frozen-themed decorations is an expensive way to achieve the Frozen birthday party theme. You can just as easily achieve the theme — at a much lower cost — by purchasing affordable light blue items (like streamers, plates, balloons, and tablecloths) and adding several Frozen balloons, cupcake toppers, or centerpieces. If you have a brother who dabbles in magic or a friend who can make great balloon animals, ask them to perform at the party as their gift to your child.